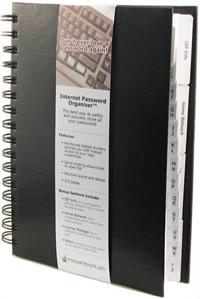 The Internet Password Organizer® provides you with a single centralized location in which to store all your online passwords. Released in 2007 our award winning design has been featured in Better Homes and Gardens, Great Day Houston, Martha Steward Living Radio, Charlotte Parent, and Unclutterer. The Internet Password Organizer has been endorsed by prominent professional organizers like Geralin Thomas of A&E’s Hoarders, Monica Ricci of HDTV’s Mission Organization, and Lorie Marrero, author and creator of The Clutter Diet®. The experts agree, creating a unique, difficult to guess, strong password and then writing it down and storing it in a secure place is the best way to protect your accounts from being compromised by hackers. The paperback version of our book features the same award winning interior layout and comes in nine different colors. To learn more about the Internet Password Organizer and why thousands of people trust our brand visit InternetPasswordOrganizer.com.